Unit:2nd Battalion, 502nd Infantry Regiment, 2nd Brigade Combat Team, 101st Airborne Division (Air Assault). Corporal Jorge E. Villacis of Sunrise, Florida. He graduated from American Senior High School in Hialeah and worked as a mechanic before enlisting in the Army in September of 2008. He arrived at Fort Campbell, Kentucky, in February 2009, where he was an Infantryman, assigned to the 2nd Battalion, 502nd Infantry Regiment, 2nd Brigade Combat Team, 101st Airborne Division (Air Assault). Jorge died December 12, in Howz E Madad, Afghanistan when his unit was attacked by an insurgent with a vehicle-borne improvised explosive device. Villacis' awards and decorations include: Army Achievement Medal; National Defense Service Medal; Afghanistan Campaign Medal; Global War Terrorism Service Medal; Army Service Ribbon, and Combat Infantry Badge. He was promoted from Specialist to Corporal posthumously. Jorge is survived by his wife; and three children and his parents. Jorge was a close friend of Staff Sgt. Juan L. Rivadeneira [Find A Grave Memorial# 61726822] who was killed in November 2010 in Afghanistan. They are buried near each other here at South Florida VA National Cemetery. Corporal Jorge E. Villacis, 24, of Sunrise, Fla., joined the Army in September 2008 and arrived at Fort Campbell in February 2009. Villacis’ awards and decorations include: Army Achievement Medal; National Defense Service Medal; Afghanistan Campaign Medal; Global War Terrorism Service Medal; Army Service Ribbon; and Combat Infantry Badge. Villacis is survived by his wife, Melissa Villacis, and children, Zackert T. Devereaux, Julian E. Villacis and Jocelyn E. Villacis, all of Fort Campbell; and parents Jorge E. and Cecilia Villacis of Hollywood, Fla.
Cpl. 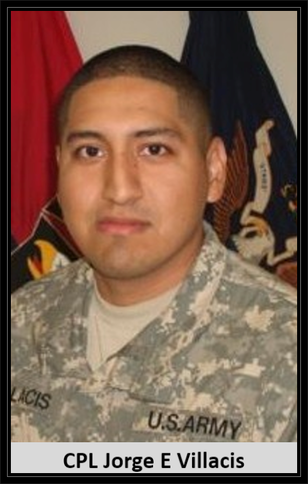 Jorge E. Villacis, 24, was killed Sunday, December 12, 2010 in Kandahar province by an improvised explosive device while supporting Operation Enduring Freedom. Despite the attempts of the Afghan Forces to stop a minibus from crossing the checkpoint in the Zhari District of Kandahar province, a suicide bomber drove the vehicle-born improvised explosive device packed with approximately 1,000 pounds of explosives into Strong Point Diwar and blew out one wall of the newly constructed combat outpost there. Six Soldiers were killed when the building collapsed on them and 11 more were injured. Also killed were: Cpl. Sean M. Collins, 25, of Ewa Beach, Hawaii; Cpl. Willie A. McLawhorn Jr., 23, of Conway, N.C.; Spc. Patrick D. Deans, 22 of Orlando, Fla.; Spc. Kenneth E. Necochea Jr., 21, of San Diego, Calif.; and Spc. Derek T. Simonetta, 21, of Redwood City, Calif.
Cpl.Villacis had joined the Army in September 2008 and earned several awards, including the Army Achievement Medal, National Defense Service Medal and Combat Infantry Badge. Before he returned to Afghanistan late last month after a 15-day leave, Army Spc. Jorge Villacis responded to his family's fears about his safety with a smiling reassurance. "He just said, 'I have to go back and finish the job. And then I'll be home,'" said the soldier's sister, Jessica Geribon of Pembroke Pines. "He didn't like to stress." At home, he liked to toss the football in the yard with his nieces and nephews, play Madden NFL video games, and root with passion for the New York Yankees. Said Ricardo Geribon, "He is a hero. He was just a great kid, with a wonderful smile. He was never mad at anyone." Capt. Kyle Henderson said of Corporal Villacis he was a guy of funny things, he used make our soldiers laugh before we would go on mission. He was a very funny guy and we met in Afghanistan. Villacis' death came just less than a month after one of his closest friends, Staff Sgt. Juan Rivadeneira, 27, was killed in in a similar incident in Kandahar. Two other soldiers with the 502nd Infantry Regiment died in that attack. Jessica Geribon, along with her husband Ricardo, her sister Jannina Salterini of Miramar, and Villacis' parents Jorge and Segunda Villacis, of Hollywood, were all at the South Florida VA National Cemetery, west of Lake Worth, on Nov. 30 for Rivadeneira's burial. As she stood next to Rivadeneira's flag-draped casket, Jessica Geribon said she could not help thinking, "I don't want to be here again for my brother. I don't want to relive this." Villacis and Rivadeneira met at Fort Campbell and became friends. Rivadeneira's heritage was Venezuelan. Villacis' parents are from Ecuador. Through the soldiers' friendship, their families became close. In November 2009, members of both families celebrated that most American of holidays, Thanksgiving, together at Fort Campbell. The two soldiers deployed together in June, but served in different units in Afghanistan. Melissa Rivadeneira, Juan's widow, who lives in Miami, rushed to the Geribons' home Sunday when she got word of Villacis' death. "She told me, 'Now they are together again,'" said Jessica Geribon. Born in New Jersey, Villacis graduated from American Senior High School in Hialeah. He worked as a mechanic before enlisting in the Army in September 2008. He also attended Broward College, and planned on returning to school. CPL Villacis' family will not be making plans for a service until after the holidays as they do not want to burden his three young children with this until after the holidays but Jessica Geribon said her brother will likely be buried at the VA National Cemetery. Cpl. Villacis is survived by his wife, Melissa Villacis, and children, Zackert T. Devereaux, Julian E. Villacis and Jocelyn E. Villacis, all of Fort Campbell; and parents Jorge E. and Cecilia Villacis of Hollywood, Fla. and two sisters, Jessica and Jannina. Father we are thankful for the service of Cpl. Jorge E. Villacis. We pray for his young family, parents and sisters as they face the hard days ahead without their beloved Jorge. Father we pray that his sacrifice will be honored and remembered in the hearts of all Americans and we ask that you welcome him into you loving arms.